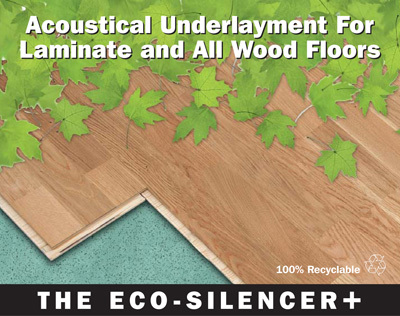 The Eco-Silencer+™ maintains the beauty of your floor like nothing else. The Eco-Silencer+™ underlayment can stand up to the pressure. Eco-Silencer+™ is made with 100% post consumer recycled granulated rubber tires. The moisture barrier film and tape strip combine to lock out moisture and allow for quick and easy installation.